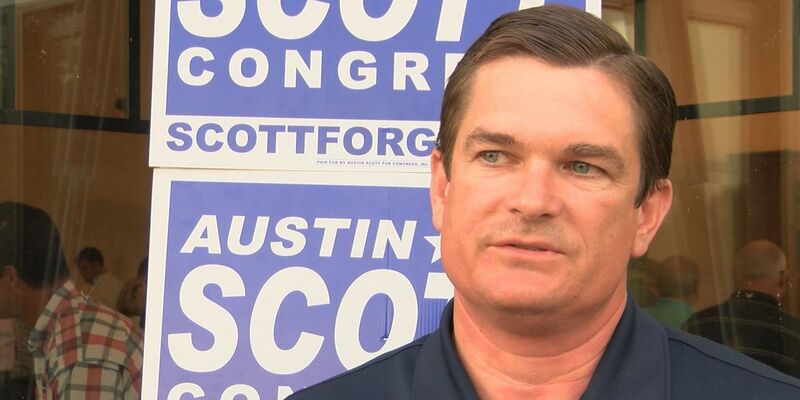 TIFTON, GA (WALB) - Election night proved to be an easy victory for 8th District Congressman Austin Scott who faced a primary challenge from Angela Hicks. Austin Scott hopes to head back to Washington for his fourth term as a United States He told us that he looks forward to continuing his work with the armed services committee and the agriculture committee. He said every American is concerned about national security so he looks forward to continuing to support our military. He also commented on the importance of agriculture to his district and our state. A large crowd came out to his party tonight in Tifton. "I think that with good leadership in the house and with Mr. Trump as president, I think that you're going to see America continue to be great and move back into that leadership role in the world," said Representative Scott. Representative Scott did say that he is absolutely behind Donald Trump's run for President. He said they see eye to eye on their desire to bring industry and jobs back to America. He also said Donald Trump gives America the best chance at restoring the stagnant trade issues with China. Representative Scott will be a heavy favorite in November against Democrat James Neal Harris.